The next evolution in home entertainment units. Unique furniture design that's so easy to use, sturdy, configurable, versatile, and so easy to put together. The 24" x 38" Media Stand provides two 8" high bays for audio/video equipment and a top surface large enough for a CRT, Plasma or LCD TV up to about 37" in size. 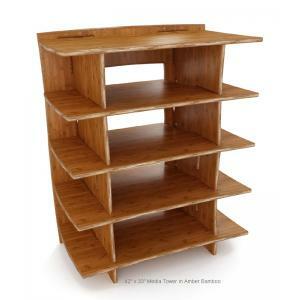 The four outer shelves provide storage for a pair of small speakers or more than 120 DVDs or 170 CDs. The 24" x 53" Media Stand provides four 8" high bays for audio/video equipment and a top surface large enough for a Plasma or LCD TV up to about 50" in size. 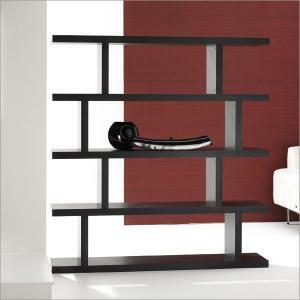 The outer shelves provide storage for a pair of small speakers or more than 120 DVDs or 170 CDs. The 42" x 33" Media Tower provides four 8" high bays for a/v equipment and a top large enough for a CRT or flat-panel TV up to about 29". 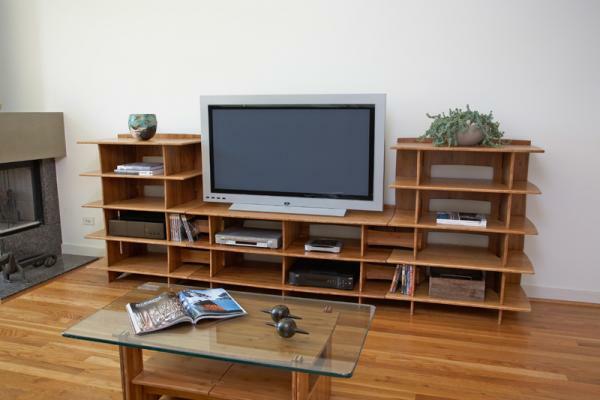 Its eight outer shelves provide storage for over 240 DVDs or 340 CDs, and it comes with two shelf rails so that you can remove a shelf to make room for larger components like a small TV or game system. Also included are small connectors that lock a tower to a neighboring stand and provide a back-stop for the lower shelves so that items like CDs and DVDs can be stored sideways without being pushed to the back of the shelves. 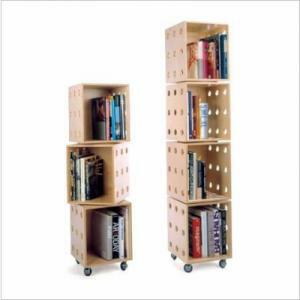 Place various sizes together to make a whole wall unit. Shelf heights can be altered by leaving a shelf out. These units lock together and are extremely sturdy. They are same collection as the Brock desk units. See other product pages for various configurations and images. 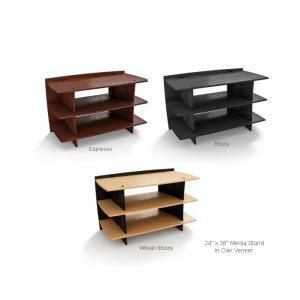 PLEASE NOTE THAT THE MEDIA STAND IN 24" X 53" IN WHEAT IS NO LONGER AVAILABLE! 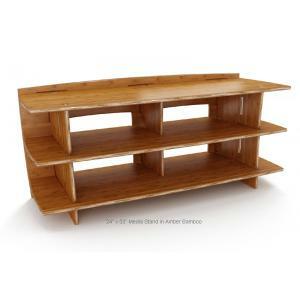 MEDIA STAND IN WHEAT 24" X 53" NO LONGER AVAILABLE!